The MAKO Spearguns South African Break Away Rig is designed specifically for rigging your spear so it “breaks away” from your speargun upon firing. This is the preferred rigging method for hunting big fish. Upon firing, the spear, the shooting line and the floatline are all immediately separated from your speargun. 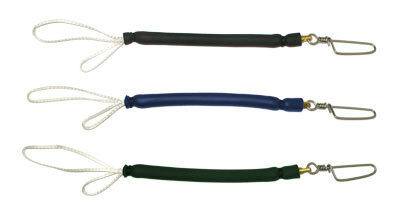 This eliminates the possibility of loosing your speargun and increases your chances of landing the big one. This method is also helpful, in sharky waters, because your speargun stays with you. After firing, put one arm through the bands. This method allows you to fight your fish with both hands while holding onto your speargun. The 10mm thickness is perfect for both Euro trigger mechanisms and American trigger mechanisms. Hand made with same high quality latex tubing, swivel clip and internal Dyneema cordage as our South African shock cords. Plenty of stretch and strong! Very good quality, will recommend, thank you guys. Haven't had a chance to use it yet since seas are too rough for blue water testing. However, looks like high quality rubber, good Dacron and seem sturdily built. Looks like it'll do great when I finally get to use it.